We are here with good news for job seekers. 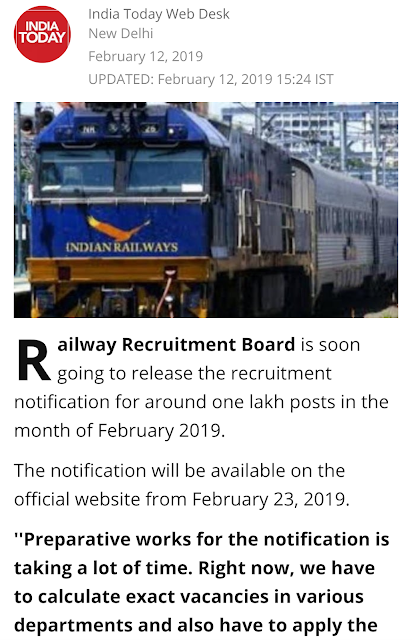 Railway Recruitment Board will release huge vacancy in this month. 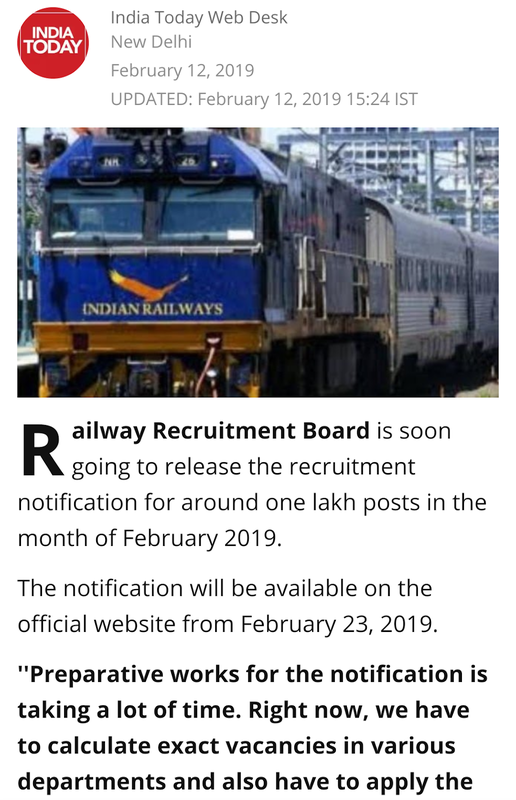 According to India Today report RRB will release 1.3 lakh vacancy recruitment notice on 23rd February 2019. RRB recruitment detailed Notification and vacancy details will be released soon. Due to newly introduced EWS reservation it will take a lot time to calculate exact vacancies in various departments. RRB has announced the recruitment drive to fill 2.30 lakhs jobs in Indian Railways. Out of which a total of 1,31,428 posts will be filled in the month of February-March, 2019 in Phase 1. Phase II recruitment process for 99 thousand will start from May-June 2020 and will be completed by July-August 2021. The recruitment for 1,51,548 posts under RRB Group D, RRB ALP, RRB JE and other recruitment in Railway is in the process now. On a related development, sources also confirmed that the RRB Group D result is expected in mid-February, but exact date has not been fixed yet by RRB.